Bringing your data to life is crucial in making others understand why it’s important. In this example, we hear how John Snow had to be creative and clear with his data to prove his theory right. If you work with data, this story is particularly useful for you. While we disagree on some things in this episode, we both agree that it’s a great story – even if it’s outside the business context. If you’d like to see an enlarged version of the map, you can find it here. I mention The Ghost Map by Steve Johnson, which you can find here. In the 1850’s, London didn’t have a sewerage system. People dumped their effluent into the Thames or cesspits. It didn’t smell very good. Disease was common. Cholera was a disease that had a devastating impact. Within hours of showing symptoms of cholera, you’d die. It takes all of your bodily fluids out of you in a very short period of time. Today they treat it by giving you lots of fluids. Thousands of people were killed over a decade. Jon Snow was an obstetrician who was into self-experimentation. In 1849, he wrote a paper saying cholera was a water-borne disease. Everyone else thought it was transmitted via the miasma (stench – you could see it). Snow submitted his research to a range of councils trying to change policy. No one believed him. Another outbreak occurred in 1854 in Soho. Snow didn’t live far away so he got the local priest. They knocked on everyone’s doors (he took the priest because people respected him) and asked how many people in that house had died from cholera. 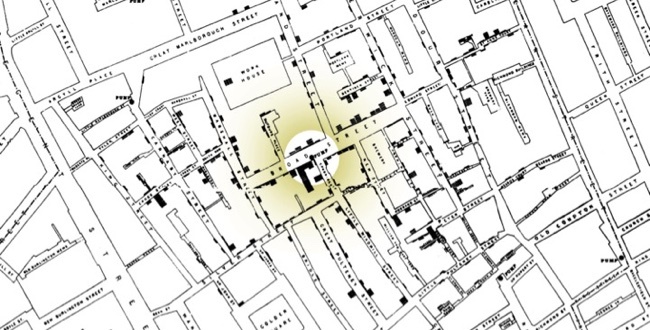 He had a map of Soho, focusing particularly on one area of Broad Street (now called Broadwick Street). For each house he visited, he drew a black line for each person who died. A pattern became clear. All the people who had died surrounded one particular water pump. There was a brewery on Broad Street where there were no deaths. They had their own well. A small workhouse had their own well too. A few people died but it wasn’t like the rest of the street. A woman and her niece who lived away from Soho also died during the same period. The aunty grew up in Broadstreet and loved the flavour of the water. They had the water transported from Broad Street. He then had a clear, visual map that illustrated it was a particular water pump that was causing all the Cholera deaths. He took it to the authorities and they agreed to remove the handle from the pump. It still has no handle. Welcome to Anecdotally Speaking- a podcast to help you build your business story repertoire. Hi, I’m Shawn Callahan. And I’m Mark Schenk, and this week we are going to continue the pattern of jumping straight into the story. So, Shawn will tell the story this week, we’ll talk about how this story works and how we might use it in business, so Shawn, over to you. Think back to London in the 1850’s, it wasn’t the pretty smelling place we know today. London back then was without a sewerage system so as a result people would dump their effluent either into the Thames or into cesspits and the place literally stank. Because of not having a sewerage system, Mr Crapper hadn’t actually invented the crapper toilet as yet, there was nothing to go into of course, but at that time there was disease just rolling through the city. And, in particular, one of the diseases which had a devastating impact on London back then was Cholera. Cholera was a particularly evil disease because once you actually had the symptoms of cholera which was vomiting and diarrhoea, within hours you were dead. I mean this is an amazing impact. The reason people died so quickly is that cholera essentially takes all the bodily fluids out of you in a very short period of time. If you get it today the way they treat it is they pump you full of fluids so you can get past the actual disease. Back then they didn’t obviously have those techniques so it was a death sentence if you had cholera. Now cholera was a big problem; there were thousands of people killed through that disease over probably a ten year period, about 1850’s timeframe. At the same time there was a researcher, a guy called Dr John Snow. Ah from Game of Thrones? No not quite the same Doctor John Snow. This John Snow, he was an obstetrician, he was into self-experimentation; he liked to test out drugs to anesthetise himself. He often would be found slumped over his desk passed out because he was doing these sorts of things, he was an experimenter let’s say. John Snow in, I think, 1849 wrote a paper sort of saying that cholera moved around the city as a water born disease. However, that wasn’t the thinking of the time. The main thinking was it was transported by the miasma. The miasma, which is essentially the smell, the breeze that was going through the city that carried this disgusting disease. Didn’t they talk about the miasma as the stench and it was kind of visible? Oh yeah, that’s right. It was a time you had those pea-souper fogs that went through London, it was that whole era that was quite iconic in many ways. its look and feel. But that was the feeling; it was to do with this stench that was wafting through the city. John Snow didn’t believe that, he believed it was actually a water born disease and he submitted his research to a range of different sort of government councils trying to get policy changes within the city and no one would have a bar of it. So, in August of 1854 another outbreak happened. This time it was in Soho and John Snow didn’t live that far away. He thought this was the perfect opportunity so he grabbed the local priest and he dragged him down to Soho and visited all the houses. Sorry, why did he drag the priest along? He dragged the priest there because he knew the priest was kind of well connected to the community and he would be able to get people to answer his questions. So, if he was this strange guy knocking on the door. That’s right so he didn’t just have this strange researcher knocking on the door he had the local priest and he would knock on the door and ask really quite tough questions, which was how many people have died at this address? I can’t help but think of Monty Python, which is, ‘bring out your dead’. Very much so. The thing that he did which was brilliant is that he had a map of the city or Soho area and he really focused on one street. Back then it was called Broad Street, it’s now called Broadwick Street, and you can go and visit Broadwick Street and see where it all played out. But he had a map and for each house he visited he drew a black line almost in the outline of the house to indicate each person that had died. So, if six people died there’d be six lines if you like and it was like a little bar graph. So, you quickly see where the people had died and how many people had died across that geographic area. And the pattern was distinct. All around this one particular area, around this one water pump was all the people who’d died. Now there were some exceptions. There was a brewery on Broad Street, no deaths because they didn’t drink water. They don’t drink water, guys in breweries, they drink beer, plus they had their own well, they didn’t need to draw from the Broad Street pump. There was also a work house, essentially it was a small prison back then in those days and they had their own well as well. They’d had a few people that had died but it wasn’t anything like what was going on around them. There was one other if you like anomaly, and that was there were two women; a women and her niece who were quite a way from Soho, who also died in exactly that same period. When they looked at it in detail they discovered that the auntie grew up in Broad St and she loved the flavour of the water from the Broad St pump, so she had it transported to her home. Yeah, and her and her niece unfortunately on the 31st August had their Broad Street pump water and in hours they were goners. The thing about this for John Snow is he now had this map that he could actually go and show, not only a visual representation of the data but it is actually the unfolding story that was clearly illustrated in that map. He took it to the authorities and immediately they agreed to take the handle off the Broad Street water pump. It’s funny I was down in Soho and they are actually doing a whole bunch of reconstruction there right at the moment but a couple of years ago you could actually see the historic Broad Street pub. And to this day, at least when I was there a couple of years ago, it still doesn’t have the handle on it. In fact, it was quite often when I was there you could see those bicycle couriers would be sitting around the pump having their lunch; that was sort of their gathering place. It’s such a historical place within London which you could easily miss. I know it was years ago that you came back from London with the photo of those bike riders gathered around that pump and you were so excited. I was excited because I did my degree in geography and the John Snow map was one of the first maps that really started the whole field of epidemiology and as a geographer it’s one of the first pieces of geographic information that starts to change policy within a modern society. So, it’s a real hallmark in the way we take data to change people’s lives and their behaviours. So anyway, that’s the story of the John Snow map. It was written up beautifully by Stephen Johnson, a journalist who wrote the ghost map probably ten years ago now. Well worth the read, you can jump on the web and type in John Snow’s Map and you’ll find lots of examples of it. You can see exactly how he went about it. It’s a very 1850’s looking map with the hand drawn lines indicating each of the deaths. It’s kind of a sad map but at the same time one that really changed how we see how a disease like cholera actually unfolds and had a devastating effect in London back in the 1850’s. Fantastic, that’s a great story. I find it so interesting that whole period of history. It sort of fits with my interest in Charles Darwin of course; it’s all happening around the same time. And again, it’s one of your favourite things; scientific stories. I love a scientific story. Tell me; in terms of that story, what do you think are the things in there that make that story work in some ways? Right of the bat I’m going to say disgust. And I couldn’t quite smell it but it was getting uncomfortably close. Right, so stench was there. But kind of the sensory information you provided there really makes that story stand out, gives a whole bunch of interest and so I found myself quite engaged. Or repulsed was it, I’m not sure, one or the other. Yeah, I think that’s quite true. I think it’s a lot to do with death so that’s something we are always very interested in; we want to avoid death so any death stories are always good, compelling that is. I certainly enjoy telling this story. It’s enjoyable to listen to. So, for me it’s an easy story to tell, I don’t have to refer to any notes, I don’t have to think about it. If someone asks me about John Snow’s map I can give a version of it. I could tell a longer version of it, I could hopefully tell a shorter version. Did you give a date that the auntie and her niece died? No, I didn’t. See it all happened over a pretty short period of time; so, I think within ten days 500 people died so these outbreaks had a devastating impact. I think the other thing too for me is, I have a picture in my head of the map, I don’t know if that comes across to the listeners so much, but in my head as I’m telling it I can really see this map, I can see the main Broad street. I can see on one side the houses and on the other the brewery, so for me it’s a visual thing and maybe I could make more of that in terms of helping people see that as I’m telling it. That story doesn’t need that extra visualisation; it’s got so many compelling elements to it without those. Adding them in I think you would risk getting too caught up in the detail. Much like I did with the Ford story. Anything else we need to point out in terms of the telling that would make it a better story? I think there are many compelling components to it so I don’t have anything on how you would make that better but I am interested in the next question; how would you use that story in a business context? I think it might have limitations in how you might use it because even though I know that story well, it’s not a go-to story for me. It’s not like I tell that story often. In fact, the only times I’ve really told it is when I gave a talk or couple of talks around data storytelling and so I used it as an example of obviously bringing your data to life using a story and a map etc. I could imagine someone trying to make the point along the lines of, if you really want to change policy maker’s minds you can’t just bring a table full of data, you are going to have to bring it to life more. You’re going to have to use maps, you’re going to have to tell a story, you’re going to have to show how it unfolded, which is essentially what that story is about. It’s an unfolding of that event of the cholera outbreak and what John Snow did and so that brings that to life. That would be probably one way I would use this story. Another way you could potentially use it is around the topic of persistence. John Snow had this belief, he expressed it as an opinion and was competing with a bunch of other opinions and his did not hold sway but he did not give up he kept going. When the opportunity presented itself he went out and collected the data and was able to present a visualisation of that data in a way that was then influential. I think your audience is quite constrained because if I was to tell that to a group of bakers they may roll their eyes and I wonder whether they would really get it. I don’t think they would roll their eyes, I think they’d say, ‘interesting story; no idea why you told it’. Yeah, that’s right, whereas if I told that to a group of scientists I think they would get it straight away so picking your audience is going to be a really important part. And it’s a good example of one of the principles about storytelling is that a fantastic story in one context might have absolutely no impact in a different context. So always being aware of who the audience is and the context for the story has a huge impact on whether that story is going to work or not. Yeah, indeed. I think those are probably the main areas in where you would tell it. Only one more very slight one which is where somebody’s got a strong view and they are going ‘we should do this, we should do this’ and you go ‘look, you need to go and get the data’. So, somebody pushing their view simply use that story as an illustration, you need to go and collect the data. It’s not a big one. No, it’s not a big one, I can imagine too if you launched into London in the 1850’s people will look at you like what the hell are you on about. It’s such a jump whereas if you told a story like oh yeah just the other day, do you know what I mean. So, on the one hand having that historical story certainly can grab people’s attention but it could also throw people off a little bit if it’s not set up in the correct way. Fantastic, well that’s our story for the day, I guess we need to give some ratings, right? Yes, let’s do the rating. I’m going to give it a 4. I loved that story, I enjoyed listening to it but we don’t rate purely on how good the story is. We rate on how useful it is because our objective is to provide stories that the listeners can put into their story banks and use in their own business world with effect. And that one has limitations in that regard. It does not take away from the fact I think it is a ripping story and I love the compressibility of it; you could tell a short version, you could tell a really long version. That’s true, and I do take some hope I suppose in that I’m sure you gave me a 4 for another story and then we heard that it’s actually been used for good effects. So, I’m hoping that might be the case for this story as well. I hear what you are saying; I’m not going to give this a high score either. I think for me it’s probably a 6 or 7 and that’s because I like the story more than its utility. However, I think in the right audience it would actually go down a treat with the right group of people who are interested in those sorts of things. And it’s actually not a bad story, this is probably not so much a business story but you can actually tell this in conversation, a nice sprinkling of flavour in a chat with some friends I’d say. Now I’d like to point out to the viewers that there is an important storytelling point about what Shawn just said. And that sometimes you might have a story that you think is fantastic but it simply doesn’t work. I have one of those and I have tried that story a number of times and I love it but it doesn’t work so it doesn’t get used any more. There are absolutely times when even though you’ve got something that you think is a really good story; if it doesn’t work you have to be prepared to let it go. You’re not saying I need to let the John Snow story go? But I think next time at the pub you should definitely tell that. Will do. Okay, guys, thanks again for listening into Anecdotally Speaking today. I hope everyone will jump in and give a bit of a rating on iTunes or wherever you find this podcast. It pops up in all sorts of different places these days. So, thanks for listening and tune in next week for another episode of how to put stories to work. Its a very interesting story. telling a story using a very limited data. However, what I am trying to connect here is how to use the technical data and convey it via story telling. For example, in the multilevel marketing, you will need to present your marketing plan, how you can earn your commissions, how to recruit people. Its more toward combining datas and tactics. how do we use the storytelling method?